Which Heroes Of The Storm Map Is Your Favorite? 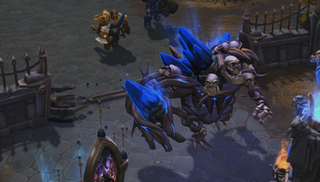 One big thing that sets Heroes of the Storm apart from the rest of the MOBA pack is the fact that Blizzard’s new game has seven different maps on which players do battle as opposed to just one. Not all maps are created equally, however. Which do you prefer: gathering skulls to avoid getting rekt by an overpowered golem in the haunted mines, or fighting bitterly over magical purple tributes in cursed hollow? Or maybe you prefer killing plant monsters in garden terror? My fellow HOTS-playing MOBA fiends and I have been arguing back and forth about the strengths of weakness of Blizzard’s assortment of maps since the game was still in closed beta. Let us know what you think by taking this poll. Make sure to explain your decision in the comments below. I’m particularly interested in hearing how and why you think the objectives in a particular map help make Heroes gameplay particularly fun. And if you have some extra time, please feel free to let us why what your least favorite map is as well.